1. Coat a medium nonstick skillet with cooking spray; place over medium heat until hot. Add onion and garlic; saute 1 minute. Add mushrooms and carrots; saute 2 minutes. Remove from heat; stir in cilantro. 2. Place tortilla on a baking sheet; broil 2 minutes. Turn tortillas over; broil an additional 1 minute or until crisp. 3. 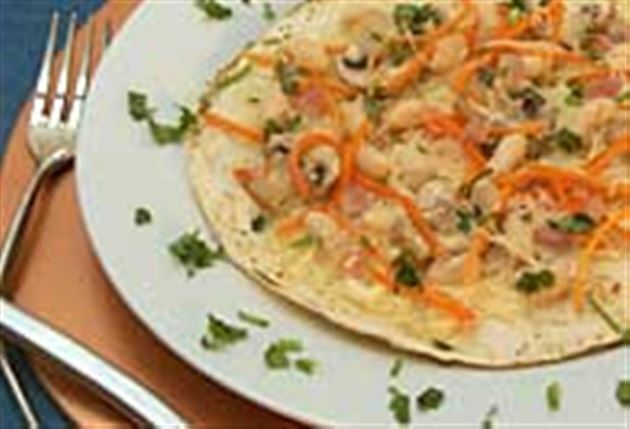 Remove from oven; top each tortilla with 1/4 cup cheese, 1/4 cup beans, and half of mushroom mixture. Sprinkle remaining cheese evenly over pizzas; broil 1 minute or until cheese melts. Enjoy this delicious vegetarian pizza Mexican recipe!